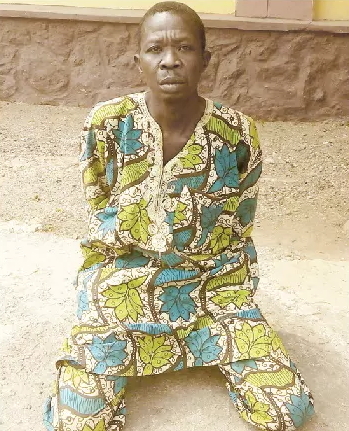 A night guard identified as Lamidi Yusuf has been arrested for allegedly killing his friend in Ogun State. The suspect reportedly opened fire on his friend, Oladepo Abiola at Opeji Village in Odeda LGA of Ogun State on the 16th of January 2016. According to Ogun Police PPRO, Olumuyiwa Adejobi, the suspect, who left his working place as a night guard at Arubiewa Farm in the area around 8am, noticed a movement in the bush, thinking it was an animal, opened fire on him with his Dane gun, and killed the deceased immediately. His case has been transferred to the Department of Criminal Investigation and Intelligence, Eleweran in Abeokuta. Ha nawa o but that was too bad bt in the other side what was he doing inside the bush? To d accused it was’nt intention. @8.am?, d day is clear enough to see what u fire at. Something is not right.